We have more than 50 houses listed for the sale. Plus, St. Johns Methodist Church is having their annual sale the same day.There will be a Google map available to the houses. We have a lot of stuff, so tell your friends! We will advertise in the paper and online. 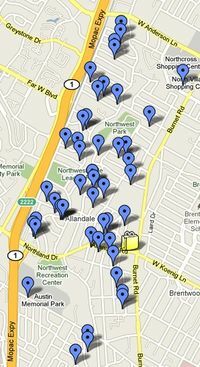 Here's the info map: http://tinyurl.com/allandalesupersale2010. We will have signs, but you may put out your own. We have more than 30 houses that have registered to have their address listed for the Allandale Garage Sale, May 8, 8 am – 2 pm. If you have listed with me, I'd like to know if you have any items you would like to feature on the Google map. (dbmc09 [Email address: dbmc09 #AT# gmail.com - replace #AT# with @ ] or this email) I posted on Craig's List and it will be in the paper next week prior to the sale. And for those of you that are listed – I hope that you are Allandale Neighborhood Association Members – this is just one of the many things we do for you in the neighborhood. We need residents involved. There are just a few of us carrying a very big load! The more membership, the bigger clout we have with the City!